Have you heard of General Motors diet that claims to reduce bulging waistline in a week? Are results of General Motor diet evident in just seven days? If the above questions are screwing your mind and making you anxious here is our article to solve all your queries. The General Motors diet promoters say that it is a seven-day eating plan to help you cut belly fat and healthily shed extra weight. This diet burns fat faster than any other eating plan and makes you lose 11 to 17 pounds in a week. The diet is also said to improve the digestion and eliminate body toxins. GM diet was created in 1895 with the help of FDA and US Department of Agriculture for the employees of General Motors to make their workers healthy and improve productivity. The diet was tested at Johns Hopkins Research Center. GM diet is focused on eating fresh vegetables and fruits along with limited meat servings. It is broken into a seven-day plan and permits the dieters to consume different food groups each day. The foods included are low in calories to create a calorie deficit. You consume fewer calories than you burn throughout the day and this promotes weight loss. Detoxification- General Motors diet encourages drinking lots of water to flush out the body toxins. By including low-calorie foods such as fruits, vegetables, complex carbs and excluding fats, refined sugar and unhealthy protein sources this diet ensures that your system is entirely cleaned in a week without getting exhausted. Quicks weight Loss- Most of the people who adopt GM diet lose 11-17 pounds in 7 days. The diet never restricts the amount of food, but it strictly confines your food choices to foods rich in fibre. The diet increases the metabolic rate, and the calorie consumption is fewer than you are burning. Also, this diet cleans your system, mobilizes fat stores, and all these factors amp quick weight loss. Builds immunity- GM diet is focussed towards eating more fresh fruits and vegetables, Fruits and vegetables are rich in minerals, vitamins and antioxidants and boosts your immune system. The body gains immunity to fight harmful disease-causing microbes and keeps diseases at bay. Improves digestion and absorption of the nutrients- As discussed above GM diet cleans your system, and thus digestion is improved. It includes fibre rich foods that absorb water into our organisation. Most of the nutrients dissolve in water, and so the absorption of nutrients is maximised by the high intake of water. Promotes bowel movements– High water intake and high fibre diet remove unholy food from your intestines. The garbage that is stuck in your gut is eliminated and all the other related issues such as constipation, poor digestion, acid reflux solves. Keeps you energised through the day- Wastes, toxins and heavy metals stuck in your body lowers the energy level. Once they are eliminated out of your system your body is hydrated, metabolism boosts and nutrient absorption increases. Thus, your the energy level rises and work efficiency improves. Skin quality improves– No matter how much money you waste on cosmetics. If you won’t eat the right food, your skin will lose its quality in lack of nutrients. Fruits and vegetables are rich in antioxidants and phytochemicals that fight free radical damage, reduce signs of ageing such as wrinkles, fine lines, pigmentation and promotes healing. Also, the GM diet encourages you to drink plenty of water. Your skin stays hydrated and shines naturally. Improves mood– Elimination of the toxic substances from your body makes you feel light. Green leafy vegetables rich in folate and vitamin B complex encourages the production of dopamine. Dopamine is a mood hormone that makes you happy. GM diet is beneficial to maintain all over health– Being low in salt, fat and refined sugar General Motors diet improves the heart health, keeps blood pressure under control and regulates blood sugar level. The first day is meant for detoxification. It is a fruit day. Except for mangoes, lichi, grapes and banana, you can eat any fruit such as apple, watermelon, pomegranates, lime, strawberries oranges or any other fruit of your choice. But along with fruits you are also required to consume 8 to 12 glasses of water in a day. There is no restriction on the quantity. Eat as much as you want. Water-based fruits are preferred. You can have homemade fresh juices or coconut water to keep you full for longer. Do not add salt, sugar or other salad dressings to fruit salad. On the second day, fruits are replaced with vegetables. Consume ‘vegetables-only’ meal plan. Eat veggies such as cabbage, peppers, green leafy vegetables, onions e.t.c. Eat veggies raw or boiled. Oil is not allowed. Better start your day with starch-rich potato. You can add herbs to make them taste good. If necessary only dash of butter, ghee or olive oil is allowed to add flavour. After breakfast does not consume potato as it is rich in the carb. To stay hydrated drink lots of water. In two days your body is now adapted to the new diet. After consuming fruits on day 1 and vegetables on the 2, the day 3 is about combining the benefits of both fruits and vegetables to provide you with a diet that is high fibre and nutrients. There is no restriction on the quantity but avoid potatoes and banana. You can take tomato juice or carrot juice in the evening to satiate your cravings for sweet snacks. Consume at least 8-10 glasses of water throughout the day. You are halfway through your diet plan. Your body is ready to burn excess calories. Stay motivated. On the day four, you are advised to eat eight bananas distributing it through the day in 5-6 meals. Also include a glass of skim milk in breakfast, lunch and dinner. Do you feel that your diet has become a little monotonous? Do not worry you have the liberty to add a bowl of GM diet soup. For dinner, you may have soup made up of tomatoes, celery, capsicum, onion and garlic. If your taste buds are troubling, you remind yourself that you are only three days away from weight loss. So stay determined. It is time to address the body’s protein requirement. Eat 10 OZ beef/ 500 grams fish or chicken along with six full tomatoes. Vegetarians can consume sprouts, brown rice, legumes or cottage cheese instead. Being rich in fibres tomatoes aid digestion. Water intake is increased to 14-15 glasses so that uric acid will be cleaned out of your body. Avoid juices. You are required to have a relatively high meal. Day 6 is almost similar to day five meal plan, but also vegetables are included. Make sure the vegetables are not fried. Salad dressings are not allowed. Consume chicken-egg or GM diet soup in the morning or evening. Non-vegetarians are required to eat 500 grams of skinless chicken, and all vegetables excluding potatoes and tomatoes are allowed. On the 6th-day the weight loss difference is noticeable. Also, there is a glow on your face. All these changes will inspire you to stay adhered to the GM diet plan. Do not give up as only one day is left. On the final day of your eating plan, you are required to have an unlimited quantity of veggies and one serving of brown rice or chappati though out the day. Supplement, the nutritional value of the veggies by adding a glass of fresh sugarless fruit juice to every meal or snack. To pamper your taste buds, you can consume GM diet soup anytime on any day in unlimited amount. The soup ensures that you are full and don’t go hungry. Better prepare it in large quantity, store in the refrigerator and then reheat and consume it any time during the week. Chop peppers and onion and saute them in olive oil. When they turn brown add chopped cabbage, tomatoes and celery. Also, add water and simmer for 60 minutes after a boil. Add a little bit of salt and black pepper to prepare a delicious soup. You may also add herbs and seasoning of your choice. Most of the weight loss eating plans are long-term. The monotonous diet makes it very tough for you to stay subscribed. But the best part of the GM diet plan it is only a week plan, and so it is likely that you will remain adhered to it until the end. However, for successful weight loss, you need to strictly follow the eating plan without cheat days. Alcohol retains water, blocks the impurities and makes the detoxification procedure tough. So for seven weeks do not consume alcohol. Drinking water is very essential. Water eliminates body toxins and also keeps you hydrated. Until the 4th day, you have to drink at least ten glasses of water and then increase the water consumption by up to 15 glasses. You may add lemon juice to water to add flavour. But avoid adding sugar or salt. Do not consume tea, coffee or carbonated drinks. If you are addicted to morning caffeine hit we have a healthy option for you and that is green tea. Do not skip any day or the plan won’t work. Avoid trans-fat salad dressings and sugar or salt. You may add herbs, vinegar, and low-calorie flavourings. Consumption of ghee, butter, and virgin oil should not exceed more than a teaspoon in a day. Strictly follow the chronological order of meal plan, or you may end up gaining weight instead of losing. Exercise every day for at least 45 minutes to prevent experiencing sudden weakness. Frequent small meals are encouraged. Avoid eating junk, processed foods, white rice, refined flour, sugary foods and also beans as they are high in calories. 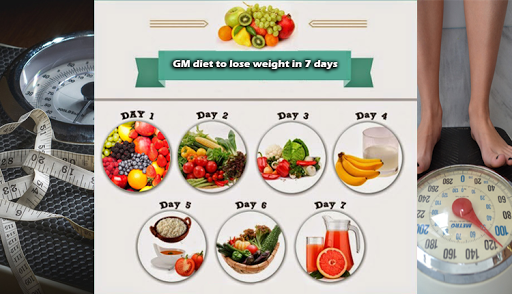 After seven days of completing the GM diet plan, you will shed a few kilos. But if you, don’t want to wash your efforts better adopt a healthy lifestyle and refrain yourself from shifting to unhealthy food habits. Avoid processed and sugary foods. Drink lots of water Minimize the intake of tea, coffee, and carbonated drinks. If you will follow GM diet plan with dedication, it’s undoubtedly going to work. But you should always be aware of its possible side effects. To sustain the GM diet plan body uses stored glycogen. This may lead to body weakness. You may experience a headache and hunger pangs. Due to low-calorie intake, glycogen stored in the liver and muscles is broken. Glycogen holds a lot of water and so when the glycogen store is depleted there is a loss of water. So maybe the weight loss claimed is water weight and not fat weight. There is a possibility that once you resume the normal diet, you will regain weight. GM diet is not a balanced diet. One of the major drawbacks of the GM diet is that it ignores the protein requirement of the body. Low protein content affects muscles and hair. Being a low-calorie diet Gm diet might slow your metabolic rate making it difficult for you to maintain weight. For metabolism, the body will use body fluid, and this may lead to dehydration. Because of the potential side effects, the GM diet plan is not recommended to practice for more than a week in a month. Also, consult a certified nutrition and your physician before starting with the GM diet plan. *Always check your weight before and after executing General Motors diet. Maintain a food diary to note how genuinely you followed the eating plan. A final word of caution: No research backs up the weight loss claim of GM diet. All the evidence are anecdotal. The weight loss achieved by this eating plan may be temporary. Thus, it is advised not to follow the GM diet continuously. *Combination of regular physical activity and healthy eating is considered the most healthy way to achieve long term weight loss.